In this piece from Mountaineer magazine, we talk to Charles Beall on his efforts to help The National Park Service become more diverse and inclusive. White, male and “midcareer,” Seattle’s Charles Beall in a lot of ways is the face of the National Park Service that turned 100 on August 25, 2016. Charles, 43, fits the bill for change partially because he must. The workforce at his agency is 83 percent white, and the federal hiring system is so Byzantine and tilted toward veterans, a dramatic change in racial composition will not come soon. Nonwhites made up 37 percent of the nation’s population, but were only 22 percent of national park visitors, according to the agency’s 2011 survey. Such disparity cemented a common belief that the system lacks relevance to communities of color. In fact, the No. 1 reason nonwhites give in surveys for not visiting national parks is that they don’t know much or anything about them. A change agent, Charles is superintendent of Seattle’s National Park units, which include Klondike Gold Rush in Pioneer Square, the national-park-affiliated Wing Luke Museum of the Asian Pacific American Experience up the street in the ChinatownInternational District, and the Bainbridge Island Japanese American Exclusion Memorial, which reflects as a cautionary tale the imprisonment of people of Japanese descent during World War II. Draw a line through those three and east to Lake Washington, and south of that line lays the state’s most diverse communities — and opportunity for Charles’ national park units to engage more people of color. Charles’ little piece of the big park service may have only the assets, personnel and budget of a small business, but he also has small-business nimbleness and gumption. Those can help him outmaneuver the inertia that can grip bigger units such as Mount Rainier National Park or North Cascades, where he once worked. Among the 59 large national-park units along with Olympic, they can get too bogged down in day-to-day worries about infrastructure, visitor management, and even climate change impacts, to have the focus and time for big-picture missions such as diversity and inclusiveness. With its Urban Agenda in 2015, the park service became more intentional about bolstering connections and collaboration between urban centers and its parks with mountains, forests and seascapes. Among its models are Golden Gate National Recreation Area, in and near San Francisco, perennially one of the two most-visited units in the system, and Santa Monica Mountains National Recreation Area, which has successfully tapped into the majority Latino population in neighboring Los Angeles. The staff at Lowell National Historical Park in Massachusetts catalyzed its own transformation to reflect the dramatic shift in its surrounding community, which now has the second-largest Cambodian population in the country as well as significant African-American and Latino populations. Charles is not just well-positioned to help diversify the national parks; he has developed a commitment to diversity that has roots at the very beginning of his career at the agency. He earned his permanent position with the park service through a now-defunct program aimed at hiring African Americans and Latinos. Though not intended, the program could be used to hire whites, as it was with Charles. He has progressed enough to see the irony and the transgression. 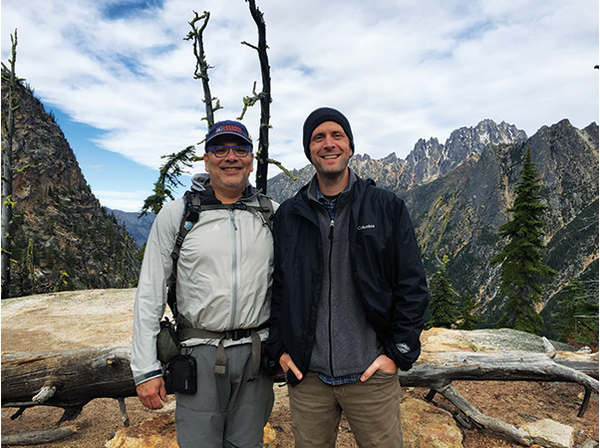 Born in Corvallis, Ore., Charles has a career mantra about doing “meaningful work in interesting places.” But he’ll also admit having bought into the mission of developing the next generation of stewards for the National Park Service. During his 10 years at North Cascades, Charles struggled against a culture that resisted visitation because it might spoil a site often referred as the “wildest place in the lower 48 states.” During a subsequent, career-development fellowship in Washington, D.C., he worked on the launch of two national monuments: Honouliuli, telling the story of Japanese during World War II in Hawaii, and Pullman, in Chicago, preserving the history of a company town that was significant to the AfricanAmerican labor movement. Along with his work on the Every Kid in a Park program, each project was among essential building blocks in the Obama administration’s efforts to improve access and commitment to public lands. In Seattle, Charles has a lot of latitude in his new post, and synergy lurks around every corner. He wants to stop forcing resources into growing visitation for a Klondike Gold Rush exhibit whose relevancy has waned. It is housed in Pioneer Square at the historic Cadillac Hotel, which sits at a critical nexus in the flow from the diverse communities of South King County, through the International District, and onto a Seattle waterfront undergoing significant change, where business and community groups aim for a return of the diversity that marked its shores for centuries. Maybe Charles will use the site as a staging area for a mobile visitors center, the likes of which have successfully taken “parks to the people” in places like Golden Gate and Santa Monica. Within Charles’ target area sit three institutions with national renown for catalyzing expertise: the Wing Luke, for community engagement; Seward Park Audubon Center, for programming for diverse youth, and IslandWood, for its urban environmental education program with Antioch University. If he had hires to make, Charles could not target diverse, young candidates — federal hiring practices don’t allow that — but those organizations could. One of the promising trends in urban national parks is the funding of park personnel by third parties that are unshackled by federal hiring rules, allowing them to hire with ethnicity or other demographics in mind. Charles can also piggyback on private organizations’ events and programs, adding the National Park Service’s expertise and raising its profile. Charles has a prime example of such collaboration in his own midst — the Japanese American Exclusion Memorial, built, maintained and supported by several community groups on Bainbridge Island. It gains its imprimatur as a satellite of the park service’s Minidoka National Historic Site in Idaho. The park service owns none of the Bainbridge property, but Charles kicks in $14,000 a year for a seasonal ranger. In the end, maybe those community organizations could inspire a model for Charles’ space in the Cadillac Hotel that is more culturally relevant and allow it to serve as a portal to the larger park units, such as Mount Rainier, North Cascades and Olympic, which seem unfathomable to many people of color who stare at their peaks from concrete vistas. Last April, National Park Service director Jonathan B. Jarvis was in the Seattle area at the end of National Parks Week. He’d spent much of his parks career here, still has family around, and was available on a day dedicated to promoting parks and outdoor activities as part of a healthy life. Charles was charged with organizing a fitting event. Thinking quickly, Charles called Seattle Parks and Recreation. An event was set at Jefferson Park in Seattle’s Beacon Hill neighborhood. Ten years ago, the park service might have insisted on holding the event at, say, Mount Rainier, but the D.C. office was happy with a city venue. Charles Beall (right) with Glenn Nelson at Washington Pass. Photo courtesy of National Park Service. This article originally appeared in our Winter 2017 issue of Mountaineer Magazine. To view the original article in magazine form and read more stories from our publication, click here.